Research is an undeniably important part of the car buying process. Not only do you need to find out which class of vehicle best fits your lifestyle, but you need to figure out which model is going to be the best fit for your ideal price point. We are here to help you with this important part of the process by highlighting all of the great vehicles we have to offer in our inventory. Here, we will be providing details on the Honda CR-V crossover. Crossovers have become incredibly popular in recent years. It gives people the best of both worlds between the best qualities of an SUV and the best qualities of a sedan. Combine this with the reliability of one of the world's most trusted car brands and you have the Honda CR-V. Read more to see available models and features of the Honda CR-V. 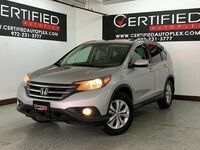 If you are in the Dallas TX area and are already considering a used Honda CR-V, follow this link to our inventory. We currently have two available models of the Honda CR-V, one of which is from 2016 and one of which is from 2014. For those looking for a wide range of features for efficiency, cargo, performance and more, the Honda CR-V has more than enough to go around. In terms of performance, you would be hard-pressed to find a much better blend of power, handling and efficiency. The 2.4L engine in the CR-V generates up to 185 horsepower and 181 lb-ft of torque, which can help it tow up to 1,500 pounds. In terms of handling, it has an available 2-speed continuously variable transmission, an electronic stability system, braking assist and much more to put the driver in full control of the vehicle. Finally, it has this without sacrificing efficiency, with up to a combined 29 miles per gallon. In terms of space, the Honda CR-V has more than enough space to carry both passengers and cargo wherever you're going. It has comfortable seating for five passengers, including 41" of front legroom and 38" of rear legroom. Additionally, it has up to an impressive 71 cubic feet of cargo storage, including 37 cubic feet of storage without folding the seats down.